1. From left to right: Mark Kozhin (MBA '00), Alumni Council Chair; Thomas Cooley, Dean; William Berkley (BS '66); Chairman of the NYU Stern Board of Overseers. 2. The 2005 Alumni Ball Committee. 3. Sally Blount-Lyon, Vice Dean and Dean of the Undergraduate College (center right); Lawrence Banks (BS '55) (right); Susan Salgado (PhD '03), Alumni Council member (center left), and her husband, Jason. 4. Michael Rosenberg (MBA '55), President of the NYU Alumni Association. 5. Russell Winer, Deputy Dean (right), with Mike Hehir (MBA '79), Alumni Council member. 6. L to R: Mary Ellen Georgas (MBA '93), Alumni Council member; Robert Goodman (MBA '80), Alumni Counci member; Shelly Greenbaum (BS '71); Susan Greenbaum (BS '71, MBA '78), Associate Dean of the Undergraduate College. 7. James Flynn (MBA '89) and wife Myrna traveled in from Northampton, MA, and danced the night away. 8. The chocolate fondue fountain was a popular gathering spot that evening. 9. L to R: Jeanne Marano, Executive Director of Alumni Affairs, with former Alumni Council Chairs Susan Jurevics (MBA '96) and Christine Schneider (MBA '94). 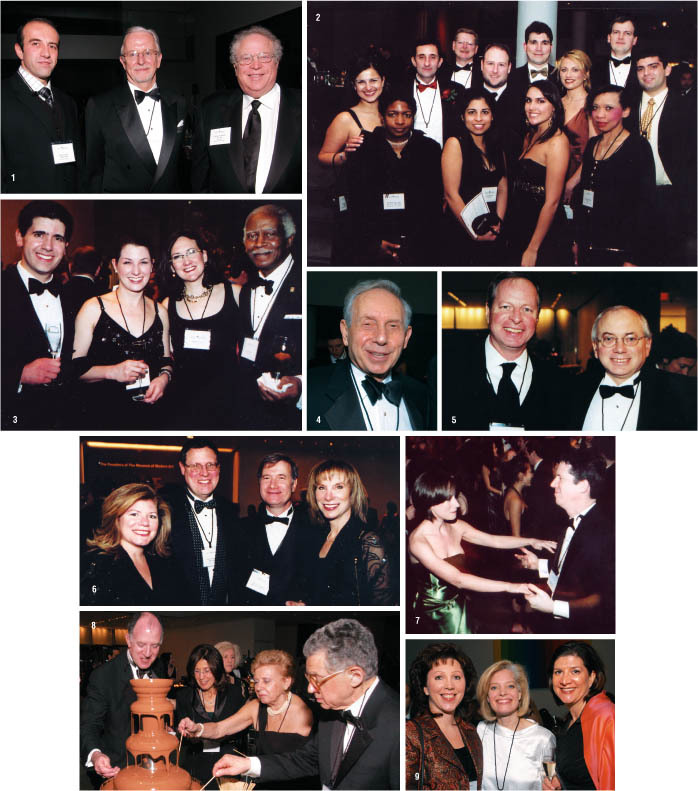 On December 3, 2005, more than 750 members of the Stern global alumni network gathered at The Museum of Modern Art for the Fifth Annual Stern Alumni Ball. The gala, which has become a holiday tradition, brings together alumni, faculty, administrators, and friends to celebrate the Stern community and its New York City location. Throughout the night, alumni enjoyed a private viewing of the Museum’s permanent collection, including Paul Cézanne’s The Bather and Vincent van Gogh's The Starry Night, as well as special exhibitions, including Safe: Design Takes On Risk, Elizabeth Murray and Beyond the Visible: The Art of Odilon Redon. 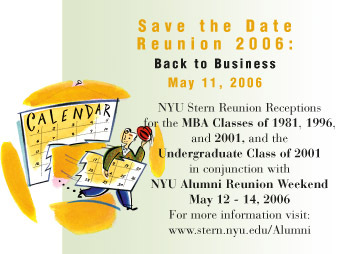 Mark your calendar for December 2, 2006, for the Sixth Annual Stern Alumni Ball, which will be held in New York City. Visit the Career Center in SWAP to sign up for the new Career Advisory Program (CAP). CAP is the online career mentoring program where alumni can volunteer to serve as mentors for fellow alumni and/or current students. Through one-on-one interaction, which can be via e-mail, phone, or in-person meetings, alumni share their knowledge and experiences, providing industry insight into organizational cultures from established professionals. CAP offers alumni the ability to select preferences regarding their interest in mentoring, including how many mentees they are able to assist each month and which constituencies they will serve, such as undergraduate seniors, part-time, full-time, or executive MBA students, and/or alumni, as well as their preferred method of contact. In addition, the Career Advisory Program allows alumni to locate a mentor as well. The advanced search tool allows mentors to be selected based on specific criteria, including industry, company, location, degree, year, and more. The Career Center also offers links to online resources, job postings, alumni resumes, and more. For additional information about CAP, contact Sheri Pillo, Senior Associate Director, at spillo@stern.nyu.edu or (212) 998-0671. With 70,000 alumni working in over 100 countries, Stern graduates constitute a truly global network, with alumni worldwide providing information, advice, and networking opportunities to fellow Stern graduates and current students. The Office of Alumni Affairs serves as the gateway to SternNet – the NYU Stern global alumni network. The Office provides dynamic and innovative content-driven programming, along with a host of benefits and services, helping Stern alumni get involved and stay connected to the School and to each other. Visit www.stern.nyu.edu/Alumni to learn more about alumni programming, communications, and opportunities to get involved. Australia, Boston, Germany, Mexico, Philadelphia, and the West Indies are just a few of the 59 regional alumni groups in the NYU Stern global alumni network. This fall saw a bevy of activity among the regions, including many partnership events supporting student activities and recruiting initiatives. MBA student organizations traveled around the world, from DC to Hong Kong, with hundreds of alumni demonstrating their support. In addition, MBA Admissions visited nearly 40 cities worldwide to recruit top talent for the MBA programs, with more than 250 alumni playing an important role by participating in recruiting events, sharing their experiences with prospective students, and securing corporate sponsorship. The NYU Stern Alumni in Mexico Regional Group, chaired by Ricardo Dadoo (MBA ’84), hosted two events this year. In September, alumni gathered in Mexico City for dinner following an MBA Admissions presentation, enjoying the opportunity to network with each other and to hear an update on the School from Deputy Dean Russell Winer. In January, the EMBA Global Study Tour held a student and alumni reception featuring remarks from Professors Ingo Walter and Roy Smith. The Los Angles Regional Group also teamed with student groups this winter. The Media and Entertainment Association (MEA), an MBA student organization, held a reception in conjunction with their annual Los Angeles TREK, bringing together alumni and current and prospective students in West Hollywood. During the TREK, MEA visited Fox, Warner Bros., ActiVision, Disney, and the Los Angeles Lakers. A complete overview of regional activities for the 2005-2006 academic year is listed in the following Regional Roundup. Alumni Leaders Travel from Around the World for the Regional Leaders Summit In December 2005, regional leaders from Australia to Houston traveled to NYU Stern for the Regional Leaders Summit. The Summit offered an opportunity to hear updates from the School and share best practices. Alumni capped off the Summit with a reception at the NYU Torch Club, where they were joined by Deputy Dean Russell Winer (middle row, second from left) and Jeanne Marano, Executive Director of Alumni Affairs (middle row, right). Several leaders stayed to enjoy the Fifth Annual Stern Alumni Ball, which took place the next evening at The Museum of Modern Art. 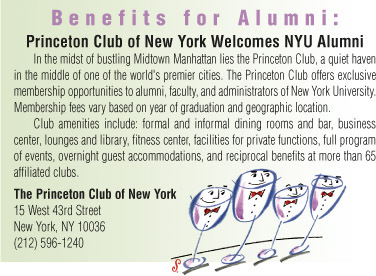 Visit www.stern.nyu.edu/Alumni to locate a group in your vicinity. For more information about regional groups or to start one in your area, contact the Office of Alumni Affairs at (212) 998-4040 or e-mail alumni@stern.nyu.edu. New Jersey alumni attended receptions in Short Hills and the Meadowlands, which featured Susan Greenbaum, Associate Dean for the Undergraduate College, and Deputy Dean Russell Winer, who provided a presentation on marketing. In addition, recent graduates gathered in Jersey City for a networking reception. Alumni in Connecticut, Long Island, and the New York metro area all attended NYU in Your Neighborhood events. NYU President John Sexton spoke at the New York metro event, and NYU Professor Ronald W. Zweig was featured in Long Island. Alumni in Boston gathered at the Federal Reserve Bank to hear a presentation from Cathy Minehan (MBA ’77), President of the Federal Reserve Bank of Boston. Boston alumni also joined MBA students for the Association for Investment Management (AIM) TREK. In Washington, DC, alumni met with students from the Emerging Markets Association (EMA), and gathered for a career event and reception featuring a speaker from Robert Half International. Los Angeles alumni attended the NYU in Your Neighborhood entertainment industry panel on “The Future of the Hollywood Studios,” while alumni in San Francisco met with students from the Technology and New Media Group (TANG). Dean Winer met with alumni in Dallas and Philadelphia. MBA Admissions also presented in Dallas. Alumni in Buenos Aires and Santiago gathered with current students participating in the “Doing Business In…” course. Hong Kong alumni met with students on the Asian Business Society (ABS) TREK, while alumni in Seoul and Tokyo met with students traveling with the TRIUM MBA program. In Moscow, alumni met with students on the EMBA Global Study Tour. Alumni in Mumbai gathered for a reception featuring Dean Thomas Cooley. In Isreal, Tel Aviv alumni gathered with current and prospective students, while NYU alumni and current and admitted students in Jerusalem attended a presentation by NYU Law Professor Moshe Halbertal. Alumni in Germany enjoyed a presentation by Professor Edward Altman, and London alumni met with students from the European Business Society. Peter Jansen (right) with members of the Westchester Regional Group at the February event. Situated on the outskirts of Manhattan, the NYU Stern Alumni in Westchester/Fairfield Regional Group represents nearly 7,000 alumni. This group, chaired by Peter Jansen (MBA ’99), has seen a host of activity over the last few years, from local wine tastings and annual golf tournaments to faculty presentations and events featuring John Sexton, President of NYU. The Westchester/Fairfield Regional Group has been especially busy this year. In November, alumni and faculty members gathered at the Doral Arrowwood Facility in Rye Brook, NY, for a reception featuring Dean Thomas Cooley, who presented an update on the state of the School and noted that Stern intends to re-establish a presence in Westchester. In February, alumni gathered at Crabtree’s Kittle House Restaurant in Chappaqua, NY, for a presentation entitled “Scoundrels and Scandals” by Professor George Smith.